Emily Johnson, PA-C is a certified Physician Assistant with Vascular Surgical Associates. She has been providing care to patients in our Marietta Office since 2013. Emily graduated from Grace College in Winona Lake, IN in 2010 with her Bachelors of Science in Biology and a minor in Intercultural Studies. 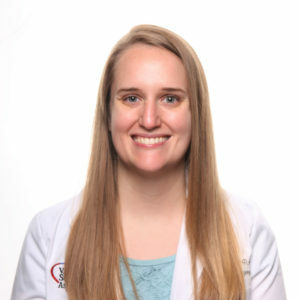 She received her Masters in Physician Assistant Studies from the University of Kentucky in 2013 and became a board certified Physician Assistant following graduation. She and her husband moved to Atlanta in 2013 for him to attend Seminary at Candler University. They have enjoyed becoming involved in a local church community and exploring Atlanta and the surrounding area. Emily also enjoys traveling and spending time with family and friends.